The Mount Washington Volunteer Ski Patrol officially closes down operations on Memorial Day weekend every year. 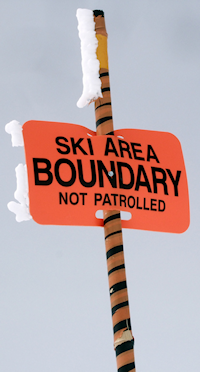 Making it the latest operating ski area within the New Hampshire Region. Every year, the Patrol throws a party on the Saturday evening of Memorial Day weekend to thank its volunteer staff of 20 plus the US Forest Service Snow Rangers for their season of service. The adventure I describe in this article was my trek to Hermit Lake Shelter to deliver the NSP Awards destined to Mount Washington. The patrol disbands on Memorial Day as the operating agreement with the US Forest Service comes to a close. The next time that these Patrollers will gather again will be the first Saturday in March for their refresher — to start a new winter season. Delivering awards just in time was my mission as the Northern Section Chief in the Region. The easy part was visiting with NH Region’s Awards Advisor Alison Potito. She handed over two awards framed on folders with pins attached. The weather report looked bleak for the weekend. I headed home to pack my gear. Knowing that multiple rain showers were in the forecast for Mt. Washington, I carefully wrapped the awards into two-gallon zip-lock bags and carefully nuzzled them into my day-pack. Around them I packed insulation layer, not knowing how cold it might get at high mountain elevation. No need to stow my Gortex jacket, I expected to be hiking in the pouring rain — the jacket would be worn the entire way up. The weather did not disappoint — rain was sprinkling from the start. Tuckerman Ravine Trail from Pinkham Notch to Hermit Lake Shelter was approximately a two-hour walk for my family and me. I decided to bring the kids and Erin for the walk and to meet the Patrollers. The approach brought us great alpine views, beautiful waterfalls and quite a lot of hikers braving the occasional downpours. When we made it to Hermit Lake Shelter, the sun cracked out between the clouds. Assistant RD Lisa Kling and Deb Brown, both members of the Mount Washington Patrol were the first to greet us. I met Robert Strauten the Patrol Director and passed on the awards (pictured to the right). We only had 15 minutes of sun before the hardest downpour of the day struck, causing us to seek shelter under the building’s overhung porch. I settled the family in for lunch, met several other Ski Patrollers, and we socialized while waiting for the next break in the rain. Several Patrollers were stationed at the base of Tuckerman’s Revine, on the snowfield that draws skiers to make the same walk up to ski. 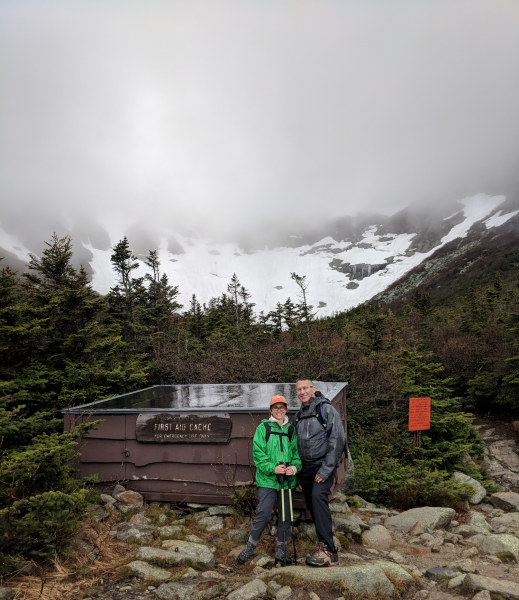 Although I did not bring my skis for this late spring hike up to Tuckerman’s bowl, I was determined to top out above treeline to see the spectacular views of the valley below. Typically one can see, Wildcat Ski slopes and the spectacular alpine environment that annually holds tons of snows for skiers to enjoy into June on the rock pile called Mount Washington. My wife Erin and I are posing in front of the First Aid Cache just below the bowl. This was a short reprieve from drizzling rain with the clouds closing in from above. After hanging around with my family socializing with the diehard skiers who braved the rains, and a group of hikers who brought sleds and inter-tubes up to slide on the snow, we decided to head back down to the Rangers Cabin (back to Hermit Lake). Most of the patrol was already preparing for their feast. As an annual ritual, they churn fresh ice cream for dessert. The ice cream was being put away in the freezer at the Rangers Station. An appetizer spread was already laid out, and most of the Patrollers were scattered about inside and outside swapping stories about seasons past. I got to meet two Snow Rangers, US Forest Service full time employees. They study the snowpack, observe the weather and forecast the avalanche dangers for the mountain. They live at Hermit Lake in a cabin that is part office, part home. It is heated with propane and powered with solar arrays and batteries. The Patrol Director was setting place placemats and flatware for the feast outdoors under the same porch at we ducked-under during lunch when the most significant downpour struck. It was nearing 4 PM, most of the skiers and tourists had already turned down the mountain. Hermit Lake was quickly becoming the sole domain of the Ski Patrolling family that volunteered their time from winter to early summer every year protecting skiers and hikers during the harshest winter days as well as the most beautiful bluebird afternoons. I was able to sit down with Robert Strauten one more time to discuss ski patrolling and the riggers of serving skiers on Mount Washington — a ski area with no lifts, no electricity and an environment detached from modern conveniences. In the winter and early spring, injured skiers have to wait for evacuation. Due to unpredictable high winds, helicopters rarely fly in to evacuate the injured. When snow reached down to the bottom, skiers are trailered down with snowmobiles equipped with cascade sleds. The Forest Service maintains one snowcat which travels up and down the Tuckerman Revine trail. But this late in the season, when the snow has melted all the way back to the bottom of the Tuckerman bowl, all evacuations are hand carried. The trip down is typically an hour walk, but it takes an organized party of 18 to carry down an injured skier in a litter. A typical party is made up of one Ski Patroller to lead the decent, the patient’s friends who came to ski, and as many tourists and other unrelated skiers that can be recruited. Primary Mt. Washington Alpine Patroller Les Bloomberg celebrated 25 years of service to the National Ski Patrol. 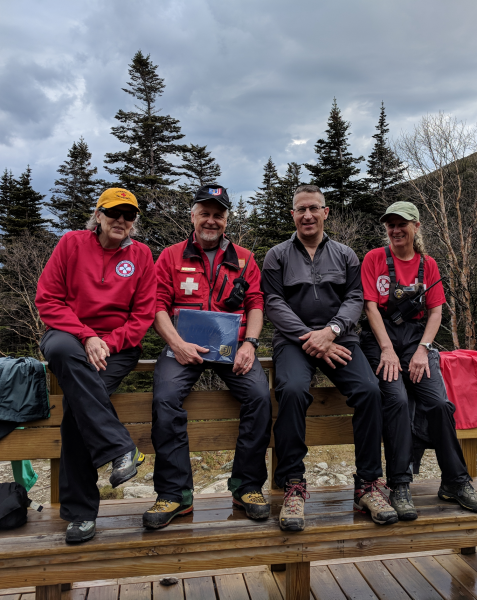 Secondary Mount Washington Alpine Senior Patroller Deb Brown was awarded National Appointment #12036 for her dedication to and leadership within New Hampshire Region. Thank you to the entire Mount Washington Volunteer Ski Patrol and the US Forest Service for welcoming my family and me during a regular patrol day on the rock pile!